This sommelier knife or corkscrew is a very weighty and high quality waiters friend, designed with the serious wine drinker in mind. It bears the name of the distinctive Ghemme wine from Northern Italy and so is made from quality mirror finish stainless steel with a wenghé pakkawood handle. The double curve form of the handle allows the corkscrew to sit comfortably in the hand, while the length gives extra leverage to remove the most stubborn of corks. 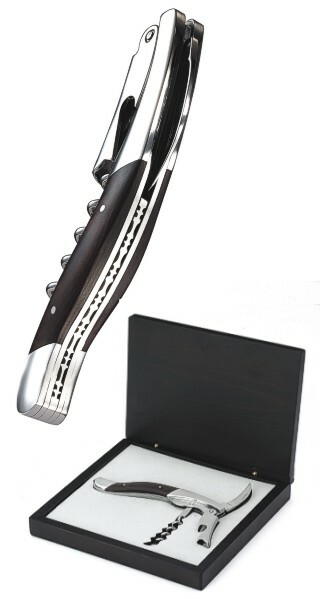 Hand crafted and finished in Italy, it is fully folding and includes an integral foil blade and bottle lever. This corkscrew arrives in a beautifully hand crafted and matching presentation box.